Meet the Urbana Current. 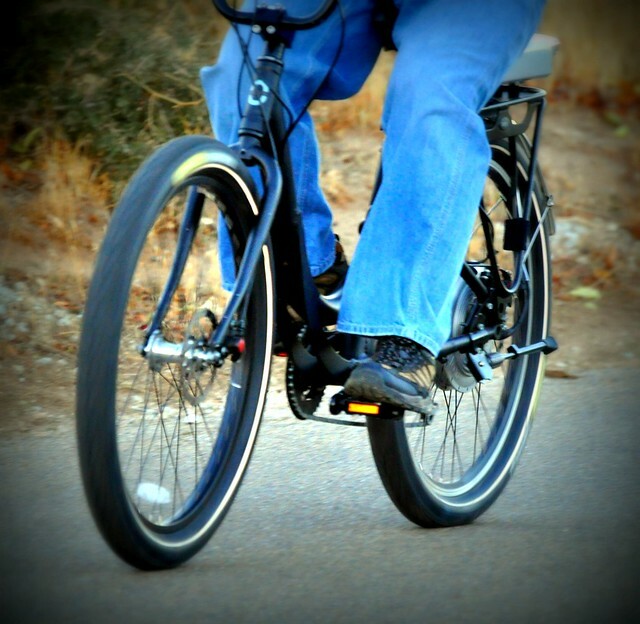 This is a new Electric Assist model that Urbana Bicycles will be introducing in the near future. We had received this bike right at the beginning of November and we’ve been putting it through its paces since then. The demo unit sent to me came from another media outlet. So when it arrived at the BikeCommuters.com Test Lab, the bike was a mess! Not only was it dirty, but it was simply torn up! UPS didn’t help the situation either, the box was punched in on the corners and torn all over. In fact the UPS Driver even suggested that I refuse the package because of the condition it came in. Well after bit of time in the lab, I was able to assemble, tune and clean the Urbana Current. The front fender was damaged during transit. Even though Urbana offered to send me a new front fender, I turned it down just because it rarely rains in Southern California. As bad as the condition of the bike was at arrival, the Current was still in working order. The electronics (which I was really concerned about) fared just fine and once I charged everything up, it all worked! That in itself is a testament to the durability of the bike. But don’t worry, I was able to beat up the Current during the testing period. Suspension:The Current is a rigid frame, but you can definitely feel the “suspension” benefits of the large-volume tires. Step-thru frame: Makes it easy to get in and out of the bike. Rear Rack:RNR rack has to be the most unique design out there. Rated to carry 100lbs…it’s definitely beefy and I was able to utilize its hooks that allowed me to carry items without the need of panniers. The three items I just mentioned can actually be found on a previousUrbana Bicycle Review that staffer Noah Dunker wrote a few months ago. With that in mind, I’ll won’t rehash some of the same things he’s already talked about. 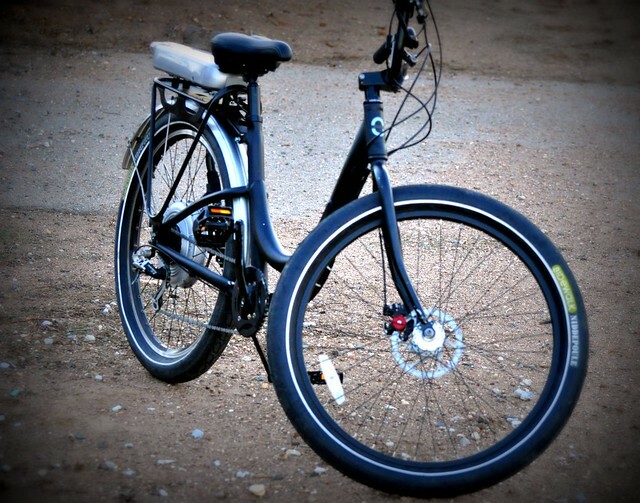 The Urbana Current is equipped with a Bionx hub and battery pack. The control panel is user-friendly — so much so, a child can operate it. While riding the Urbana Current on full pedal assist, I was averaging about 15 miles per charge (your mileage may vary depending on your riding conditions) at an average of 15mph. This is a mixture of flat and hilly terrain. Keep in mind, I’m a big boy: 202lbs. During the testing period, I never experienced any problems with the electrical system. Charging the battery took a few hours. Basically as soon as I arrived in my office, I’d plug it in; by lunch time, it was 3/4 charged and by 2:30pm, it was 100% charged. 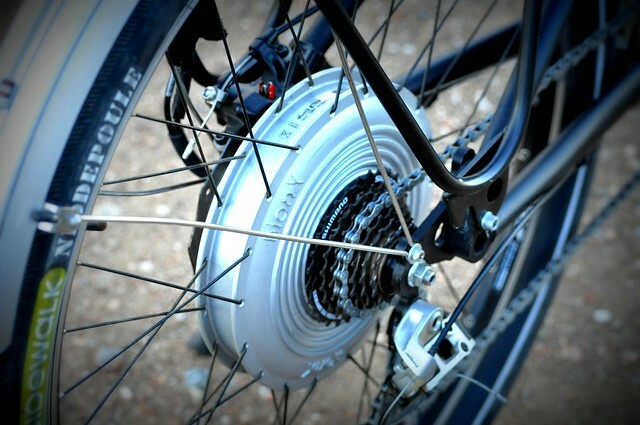 The Current came equipped with Avid BB5 disc brakes. I’ve always been a fan of BB5s because they provide awesome stopping power for a fraction of the cost of their hydraulic counterparts. One thing I have to admit when riding the Urbana Current: it’s straight out fun! I’ve let about a dozen people, ranging from my kids, my wife, and all the way up to professional mountain bike racers ride the Current, and they simply loved the bike. It never fails to put a smile on people’s faces. Durability: One concern I had with this bike was its durability. Personally, if I were to spend $3299, I want to make sure this bike lasts. With that in mind, I put this bike through the wringer. Believe it or not, Urbana Bicycles told me…“We want you to try and BREAK IT!” WTF? Were they serious? They were, because when I asked them to repeat what they just said, they said it with more confidence and with a serious tone….“We want you to try and BREAK IT!” So I obliged. For the durability test, I had about 5 professional Mountain Bike Super D Racers TRY and damage this bike while riding it through a Super D Race course. Granted, there were no jumps, but the terrain was pretty brutal even for mountain biking standards. One thing I have to say is, the wheels are bomb-proof! Even after the Super D course, they stayed true and I never experienced a flat tire. Another note I need to add, the battery pack stayed in its place the whole time. In addition, I left the bike out in the rain and guess what? The bike works just fine. The circuitry was untouched and moisture did not penetrated the LCD control panel. 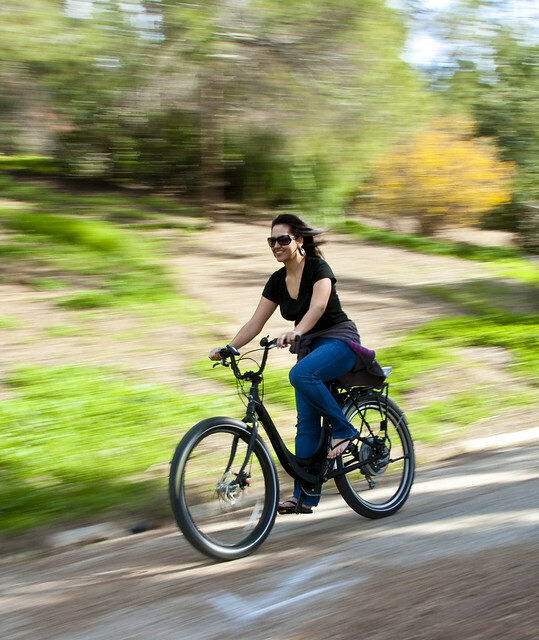 Since this was my second e-bike review, I have been asked “Which one do you like better? The OHM Urban XU700 or the Urbana Current?” To tell you the truth, they are both different in their own ways. For starters, the OHM has a front suspension fork, and a suspension seatpost which made potholes and other imperfections of the road more manageable. But the Urbana’s slack geometry was more comfortable overall. 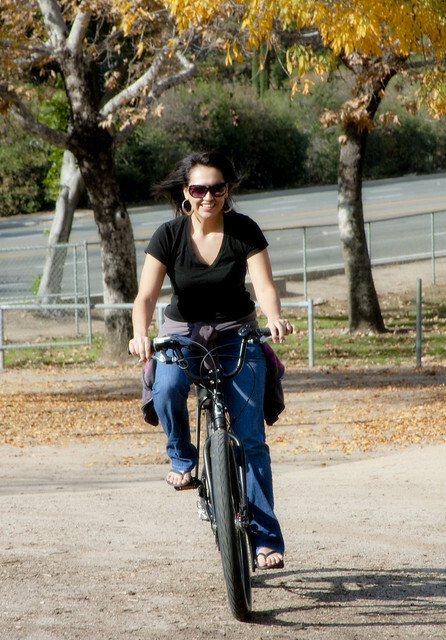 Though it lacked a suspension fork, the high-volume tires did make the ride more bearable. However, I think the Current can benefit from a suspension seat to smooth things out a tad more. 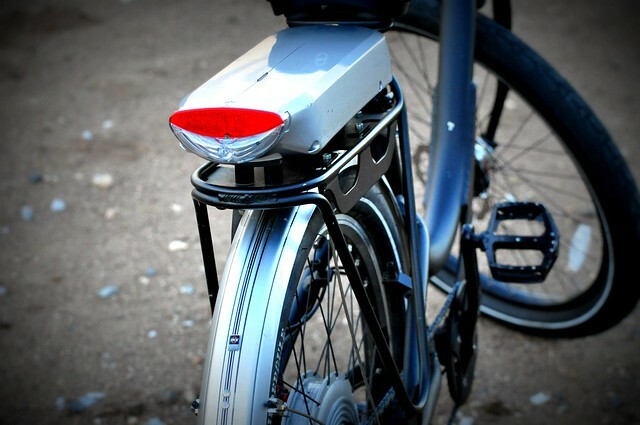 If I may, one thing I’d like to see on the Urbana Current is a front light. The battery pack actually comes with a tail light, so they might as well as add one in the front, right? 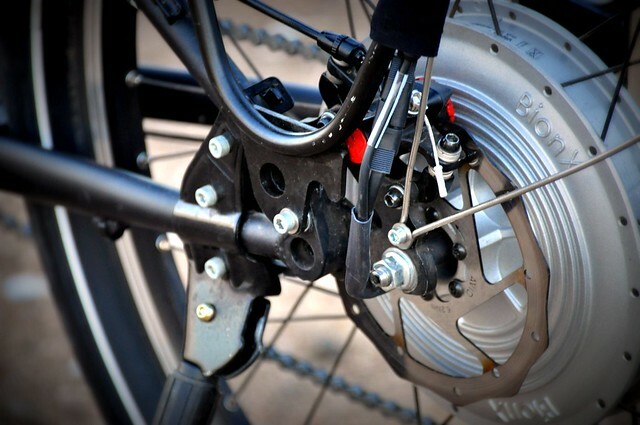 If that’s too much strain on the battery, perhaps equipping the bike with a Shimano Dynamo hub to power the lights? The items I suggested aren’t a deal breaker at all. The bike with its current spec sheet is fantastic: precise shifting, powerful braking and a wonderful geometry that allows riders from 5′ to 6’5″ to ride it without a problem. As much abuse as the Urbana Current has received, I’m genuinely surprised that it has survived this long. But what’s great about it is, the way it rides, you never would have guessed that it’s been through the wringer. The Urbana Current doesn’t disappoint and just keeps on riding! Sounds good. But 15 miles/charge? Wouldn’t be useful to me, especially at that price point. Yeah, I’m a bit surprised at that distance per charge. BionX systems are considered the “Cadillac” of e-assist kits…but I thought they had much better range than that. Of course, most users wouldn’t necessarily use the full-power assist at all times, so distance per charge would go up accordingly. It came out to 15 miles for me. That’s based on my VERY hilly commute. I used the full assist mode most of the time and when going up the hills, I didn’t even pedal :). So that could explain the mileage per charge. I would think that on flat commutes I could easily get about 20 miles on full assist and even more if I was pedaling with it. Makes sense…the old “your mileage may vary”. I was able to squeeze about 30 miles out of the Current — this is in fairly flat Silicon Valley, though. In hilly Santa Cruz, 15 to 20 miles was a little more typical. 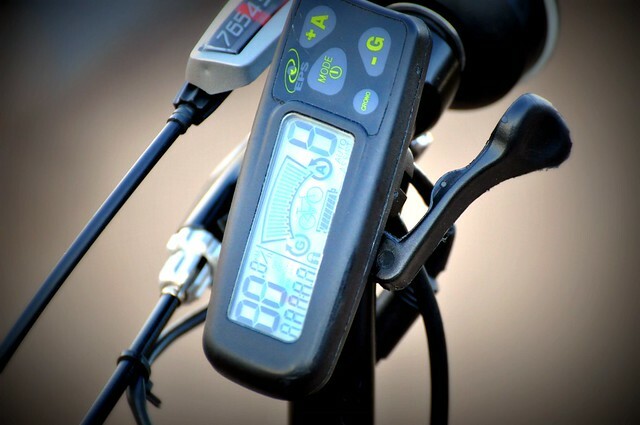 Hey guys, the Bionix system gives 60 km (37 miles)with level 1 assist…and ofcourse there are other factors, Distances vary depending on road conditions, riding surface, cyclist weight and assistance required)….as per Bionix. I was on level 4 assist the whole time. I couldn’t help it…its FUN! Thanks for another write-up on another electric assist. I purchased a kit that had the battery located on a rear rack and I found that it made to front end very light and the rear of the bike wanted to swing around naytime I took any medium size corners. Did you experience similar feel? what about compared to the Ohm bike? 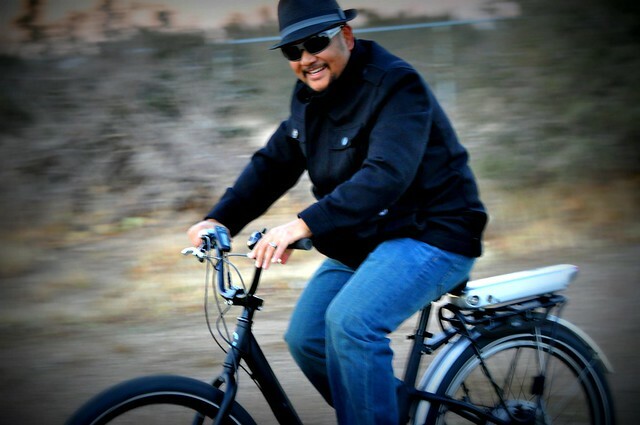 The Ohm was pretty balanced, as I mentioned in the review, it rode like a regular bike. On the Urbana, the front end was lighter, but manageable. It made for fun times skidding! Thanks for the e-bike reviews. I’ve been saving my pennies for one but had next to no “real world” test information on them. Like the rest of your reviews, this one is a joke. No actual critiques of the bike, just a fluff piece written to keep the sponsors coming. The bike is ugly, gets pathetic mileage per charge and is grossly overpriced. Not to mention it brings nothing new to the table. And you had “about 5” bike racers ride the bike? Where are the pictures? Which racers were they? Can you not count to five, so you had to say about 5? Great review, I love that the company has such trust in the bike. I have an ezip and with my lithium battery I get 40 miles with no pedaling on it, moderately hilly. 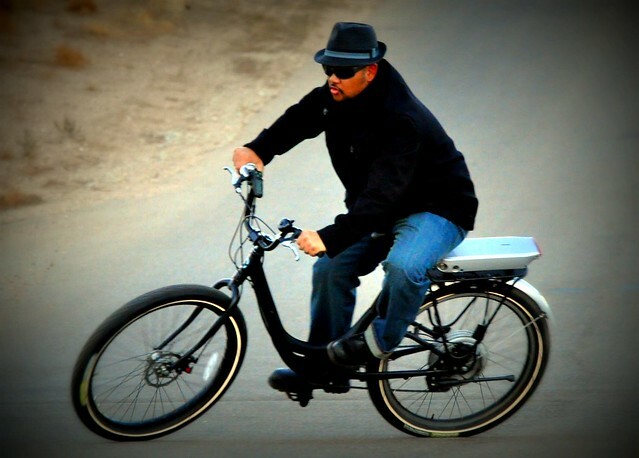 The cheaper battery gets like 17miles with pedaling. Luckily it can hold 2 batteries but the lithium costs $350 which is what the bike cost. Ebikes are great for hauling loads and extreme temps. I love them.